EDUR is a pump company known throughout the European Federation for being one of the most energy efficient pumps for industry available on the market today. 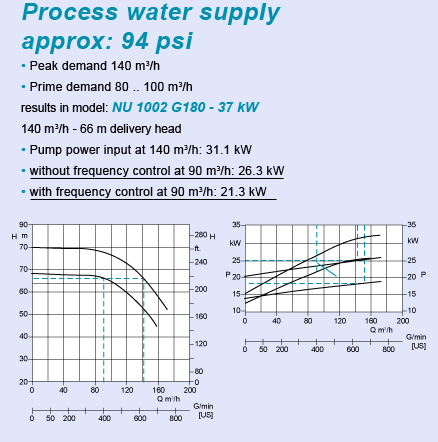 Energy costs are rising, and whereas before in many instances a pump was not necessarily purchased for its energy-efficiency, with rising costs of energy today it is now becoming a standard practice to factor these costs into the full operation cycle of a pump and pump system. Companies can attain up to a 50% increase in energy savings by purchasing an EDUR pump for your system! Here's how. Up to 50% energy savings can be achieved right from the start by having optimised your plants configuration along with the purchasing of the correct pump for your application. Companies in many instances with very few minor changes to plumbing and configuration can achieve this remarkable number. Shanley Pump and Equipment and EDUR will work with you to help you reach your maximum potential for energy efficient pumps. 20% energy savings can be achieved by the utilization of a speed control with a frequency converter. 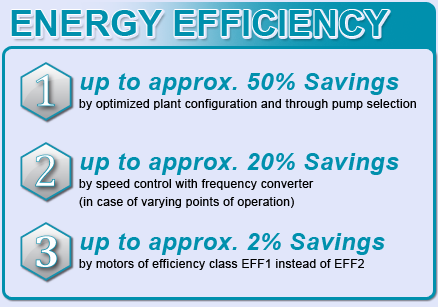 Lastly, 2% energy efficiency can be reached with the selection of a highly efficient motor. With the higher cost of energy becoming a daily reality, this savings over even a few years ago is what truly separates EDUR from the rest of the DAF and even Centrifugal pumping industry. The days of purchasing the cheapest pump for the job are no longer truly feasible as there is no "cheapest" pump available anymore. There truly is only efficiency in both operation and energy consumption for which EDUR is a world-leader.